Sorry I Slept on Your Face: Breakup Letters from Kitties Who Like You but Don't Like-Like You est le grand livre que vous voulez. Ce beau livre est créé par Jeremy Greenberg. En fait, le livre a 64 pages. 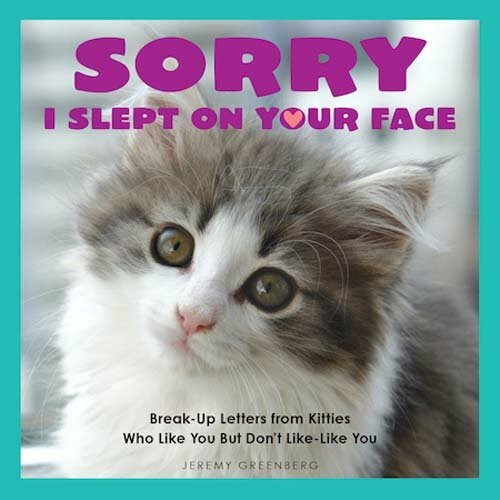 The Sorry I Slept on Your Face: Breakup Letters from Kitties Who Like You but Don't Like-Like You est libéré par la fabrication de Andrews McMeel Publishing. Vous pouvez consulter en ligne avec Sorry I Slept on Your Face: Breakup Letters from Kitties Who Like You but Don't Like-Like You étape facile. Toutefois, si vous désirez garder pour ordinateur portable, vous pouvez Sorry I Slept on Your Face: Breakup Letters from Kitties Who Like You but Don't Like-Like You sauver maintenant. It's not you. It's meow. Your cat likes you, but does she like-like you? Sorry I Slept on Your Face gives it to you straight—straight from kitties to their loyal owners in the form of very personal—and hilarious—breakup letters paired with adorable and sweet photographs. What does it mean when your cat bites your toes as hard as she can? When she suffocates you with her body, is she just getting comfortable or is she trying to tell you she needs more space? In Sorry I Slept on Your Face, cats, in all their superiority, break up with their owners through sorry/not sorry letters illustrated with cute, funny, sweet photographs. This book will make you laugh and make you ponder your relationship with your own cat.